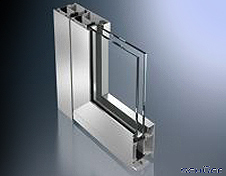 Thermally insulated, high stability aluminum profiles. Different interior and exterior colors possible. Optional low to high exposure thresholds or no threshold. Design flexibility in profiles, exterior trims, frame dimensions, hardware and finishing. TRU aluminium doors open up numerous new possibilities for the attractive design of the outside of the building envelope. TRU Entry Doors are customized to meet the most demanding architectural requirements; including specifications for concealed hinges, transoms with custom divided lite patterns, and over-sized doors. The TRU difference is in the sophisticated technology and excellent system compatibility. From high traffic entryways to the seamless integration of doors in to a wall of glass, our system provides the optimum combination of design and function. The TRU generation of mechanical concealed fittings sets a new standard in fittings technology. This technology has the same impressive features and technical capabilities as surface-mounted fittings, and allow doors to swing 180°. All standard door sizes are possible. The new series of universal handles completes our range of technologically advanced products for all aspects of opening units. The uniform design range is extremely easy to operate and has an impressively clear language of form. With minimal escutcheons our handles are modern luxury and suitable for all swing doors. The combination of design and technology even accommodates the special requirements for fire protection. High levels of thermal and sound insulation. Sleek hardware and locking system. The gear box built into the style of the door for a cleaner aesthetic. Full capabilities for integration in to other TRU systems. Multi-point locking systems for exceptional security.